Everyone knows the famous cable car lines that run on Powell and California streets, but even long-time San Franciscans may be surprised to learn that there were once cable cars on Market Street. These long-lost cable car lines came in a variety of colors, and each hue — candy-apple red, canary yellow, forest green and pastel blue —indicated a different route. Numbers and letters were not assigned to transit routes until 1909. Until then, colorful paint schemes were crucial for passengers to spot their ride. 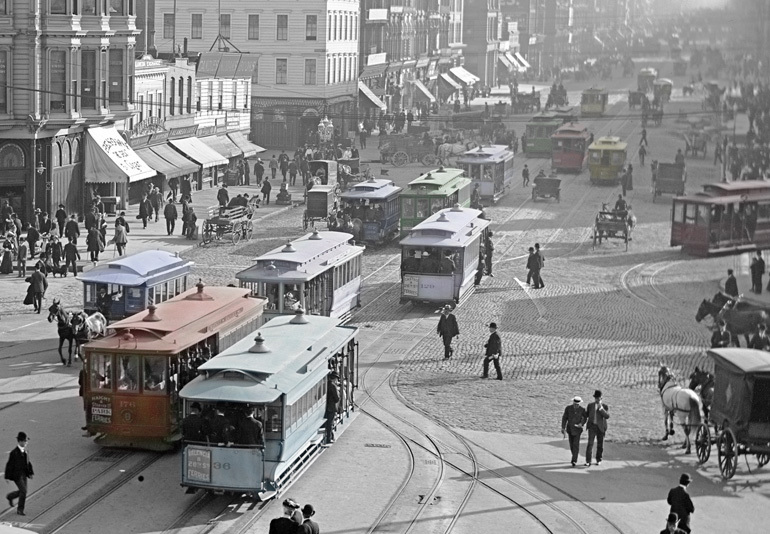 In this 1905 photo, color-coded cable cars and other vehicles make their way up to the foot of Market Street. Note that colors were added to this SFMTA Photo Archive image for this blog. 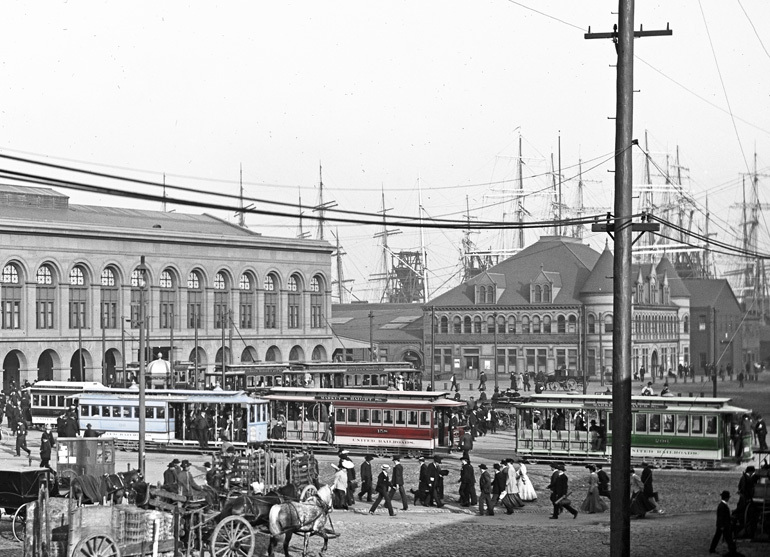 Before the devastating earthquake of 1906, these vibrant cable cars started at the Ferry Building and followed routes that would be familiar to many Muni riders today. The Haight Street cable cars – the ancestors of today’s 7 Haight route – sported a bright fire-engine red paint job. For riders of the 21 Hayes, the cable car to catch in the 1900s would have been a deep, dark green. And to get to the Mission, Victorian passengers would have looked for the Valencia Street’s sky-blue cable cars. Market Street at the foot of the Ferry Building in 1905. On the left is a pale blue Valencia cable car, in the middle a red Haight cable car and on the right a green Hayes car. This image is part of the SFMTA Photo Archive collection. Note that colors were added to the image for this blog. Much of this information on the colorful past of the Market Street cable cars has been brought to light by transit historian Emiliano Echeverría, who is a great ally of the SFMTA Photo Archive staff. We’re hugely grateful to him for sharing his knowledge and resources with us. Several of Mr. Echeverría’s books on the history of Bay Area transportation, such as “San Francisco¹s Powell Street Cable Cars,” are available at the San Francisco Public Library. To explore more images of our fair city’s transit past, check out the SFMTA Photo Archive on Twitter and Instagram.